GIS improved local efforts to monitor and report to regulatory agencies. ArcView allowed CLA to explore different spatial and temporal relationships. GIS helped the authority stay well within budgetary constraints. Located in western Connecticut, Candlewood Lake's surface waters span some 5,420 acres and are surrounded by more than 60 miles of shoreline with approximately 60 percent of that residentially zoned and developed. The lake is one of the premier destination locations in the tri-state area (New York/New Jersey/Connecticut) because of the many recreational activities available, including boating, sailing, fishing, and swimming. However, the first and foremost use of the lake is as a pumping storage facility for FirstLight Power Resources, a hydroelectric company that owns the lake and the shoreline up to the 440-foot contour, or approximately 11 vertical feet above the recreational level of the lake (429 feet). A GIS screen image of an undeveloped parcel along the water's edge. This means that those individuals with lakefront property do not own it down to the water but are instead "abutting property owners," i.e., those whose property borders the 440-foot contour and FirstLight property. Because of its use for recreation as well as power generation, the lake falls under the jurisdiction of the Federal Energy Regulatory Commission (FERC), which required the owner of the hydroelectric facility to create and implement a Shoreline Management Plan (SMP) to help balance the public and private use of the lake. FirstLight's SMP outlines the need for a GIS system to monitor activities on the shoreline and keep track of licenses and other land-use documents issued to abutting property owners. Additionally, the SMP indicates that FirstLight should consult with the various other agencies that have a stake in the future of Candlewood in the establishment of the GIS system. 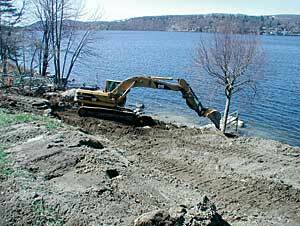 The Candlewood Lake Authority (CLA) is one such agency. Charged with monitoring the water quality of the lake and providing public safety, CLA sought to establish the prototype GIS system to help monitor the shoreline in conjunction with FirstLight. In addition, staff from the Northwest Conservation District (NCD) of Connecticut, a publicly funded natural resource conservation agency, provided technical support. The project lasted from August 2006 through January 2007 and took some 400 man-hours to complete. The centerpiece of the project was ArcView software, which was used to store and analyze all the geospatial data collected for the project. ArcView was selected because of its basic desktop GIS capabilities, including extensions, to conduct simple queries, analyze spatial relationships, and create maps with simple edit functions. A digital Ricoh Pro G3 camera, lent to CLA by FirstLight, was instrumental in collecting pictures that had GPS points embedded within them and could thus be linked at a later time to the parcels they represented. Also, parcel information for the lots abutting the lake that was provided by the five municipalities surrounding the lake (Brookfield, Danbury, New Fairfield, New Milford, and Sherman, all in Connecticut), as well as the aerial imagery of the lake collected by the Connecticut Department of Transportation in 2004, was instrumental to the success of the project. The data collection was broken into three main categories: document, picture, and parcel. For the document data collection, relevant land-use activity documents (provided by the municipalities' inland wetland commissions) were scanned into PDF format and sorted into folders by property address and town. These documents included applications, notices of violation, cease and desist orders, site plans, and commission minutes and were digitized and placed into the appropriate subfolder. For the purpose of the prototype project, CLA selected approximately 20 sites (all of which were ones CLA had provided some advisement or opinion on at the request of the property owner or town) and scanned some 165 documents. 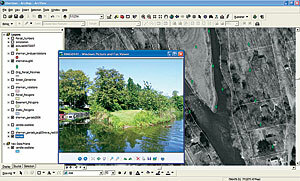 This provided the basis for the land-use document data, which would later be integrated using ArcView into the rest of the geospatial data. The second type of data that was collected was picture data, or a photographic inventory of the shoreline. NCD and CLA staff members navigated the lake by boat and photographed the shoreline in front of each abutting parcel using the Ricoh Pro camera. Staff referenced parcel maps to ensure that each property was photographed, taking more than 2,500 pictures by the end of the summer of 2006. Afterward, the photographs were downloaded to GPS-Photo Link, software that converted the images into an Esri point shapefile, with each picture containing the GPS coordinates of the place where the photographer was standing when the photo was taken. After adding the shapefiles into ArcView, the picture points had to be moved from the spot where the photographer was standing (usually some 100 yards offshore) to the actual parcel that the image represented. After enabling hyperlinks for the picture layer, clicking on a point in the photo shapefile opened the image of the shoreline property. In this way, the entire lakefront (as of the summer of 2006) could be viewed in pictures. The last set of data collected was parcel data. This required obtaining parcel line shapefiles from each of the five towns around the lake, as well as from the Housatonic Valley Council of Elected Officials (HVCEO), the regional planning agency that also assisted in many of the technical aspects of the project. These parcel lines were overlaid onto the aerial imagery. Additionally, tax assessor information from each municipality on the lake was collected, and the assessor database tables were joined to the parcel layer tables. This enabled the user to click on a parcel and see the owner name, address, and size of the lot. Once the parcel, tax assessor, and picture data was compiled in ArcView, the last step was to link the property subfolders to the corresponding parcels. By inserting the path into the property subfolder in the hyperlink field, the user could select a highlighted parcel and be redirected to the file that held the land-use documents for that property. Already, this GIS system has improved local efforts to monitor and report to regulatory agencies on shoreline activities. It has helped CLA pinpoint well over a dozen land-use violations since August 2006 and has aided CLA in working with the power company to monitor the use of its shoreline. Melinda Tarsi, a graduate intern with the Candlewood Lake Authority, holds a B.A. in political science and a B.S. in justice and law administration from Western Connecticut State University. Kristen Ponak, a cartographer and webmaster for the Northwest Conservation District, holds a B.S. in GIS and Web technology from the University of Connecticut. Larry Marsicano, the executive director of CLA, holds a B.A. in biology from Western Connecticut State University, an M.A. in botany from Connecticut College, and graduate certification in GIS technology from the University of New Haven. For more information, contact the Candlewood Lake Authority (tel. : 860-354-6928, e-mail: claexecdir@earthlink.net).